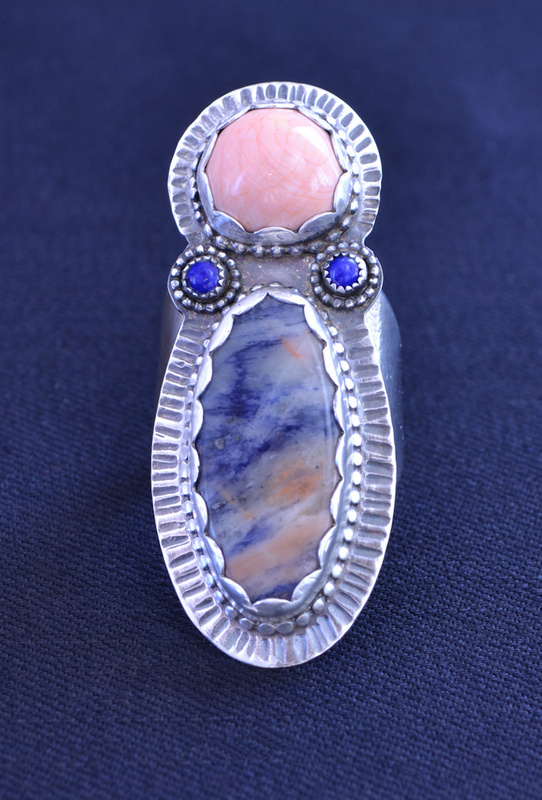 This ring began with the pretty Sodalite. I had never seen one with pinks like this one has. The poor stone felt a little lonely though. I searched my stash one more time for a companion, and came upon the Mexican Fire Opal which had been languishing unused for years and it was a match made in heaven! Both seemed so happy together! The Fire Opal has just a bit of play of color, enough to be entertaining if you hold it just the right way. 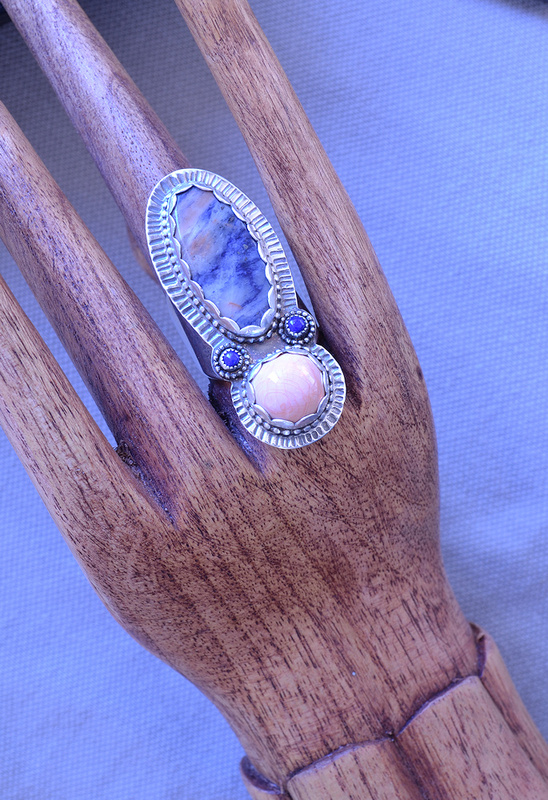 It's a peculiar color but it picks up the color in the Sodalite perfectly. There is a variety of Sodalite called Hackmanite which can exhibit tenebrescence (mineralogists are almost as fond of strange and wonderful words as biologists are!). I saw some cabs in Tucson in 2015 but unfortunately the stones were small, not very pretty, and had only their tenebrescence to account for their high price tag. That is, they were creamy white with some specks until exposed to sunlight or UV light at which point they turned a nice pinkish color which was said to persist for several hours. The Wiki article on Sodalite says much of it will fluoresce a "patchy orange" under UV light, but this one does not. Philip Ball's essay on Sodalite in Within the Stone was written to accompany a deep blue Sodalite which looks like a photo of deep space, unlike our stone which is more like a cloudy sunset against the deep blue sky of Mt. Everest. Still he makes a remark worth pondering, "If physicists ever find a unified Theory of Everything, only a handful of them will be able to understand it--that's how simple it is." I do like this book and you might too, it is linked below. 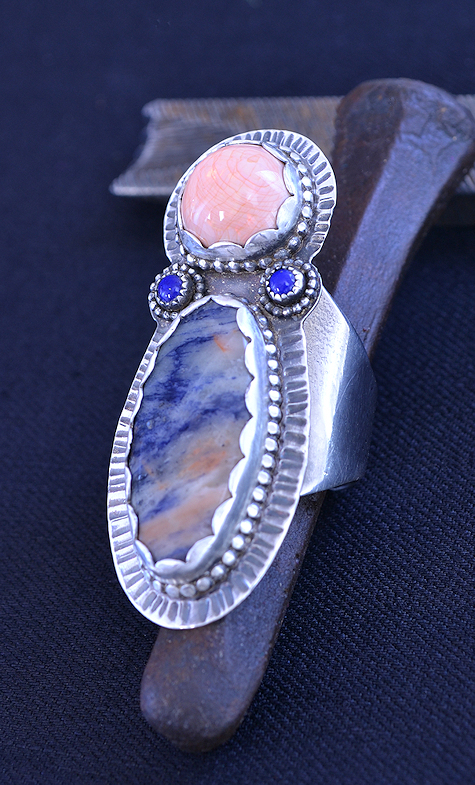 Jordan mentions using Mexican Fire Opal to call upon ancient wisdom, and relates Sodalite to the third eye. Golnaz Alibagi mentions Sodalite in the section on healing childhood scars. Melody says it can provide access to the sacred laws of the universe. When you order, please let me know your ring size so I can adjust the ring for you.